Long story short, my father passed away recently and going through some stuff I found all kinds of trains, track, buildings, etc, etc. I wish I had paid attention to them when he was alive and now feeling guilty I would love to do something with these. The problem is I have no idea where to start. I made a little circle with the track and hooked it up (correctly I hope) but not too successful at getting them running. All together there are about 20 engines and a whole ton of cars to pull behind them. I have been able to get maybe 4 of the engines running although very rough. I have no idea what is wrong with them. Most of the engines say Tyco on the bottom. One says Bachmann. I was told by the closest hobby shop to me (4 hours) that Tyco is no longer in business so if I need parts or service I am out of luck. I have called Bachman several times today and left messages but can't get anyone to call me back. I am getting very frustrated with not knowing how to proceed. Posting photos will help a lot. Posting pics won't help get your trains running for sure. First try cleaning the track, there are several ways to accomplish this. Do a search on track cleaning. Second try using a multi meter to check voltage from the power pack, if it's old you may have a problem getting sufficient voltage. After that repost your findings and we may be able to help further. Is there a Trains for Dummies somewhere here on this forum? I just laid out a simple oval track and one engine runs great. The others will chirp and pulse when running. Others have no power at all. I will get around to posting some images of what I have. I guess the important question is before I get too deep here it looks like only one engine is a Bachmann, are you guys willing or able to help me figure out this mess? What I mean is I do not want to waist your time. I realize most of my stuff is quite old and may not be worth much but for the memory of my dad I would love to get something up and running for his grandkids and great grandkids. I would like to devide up allot of the stuff and give to my kids (5) all of which are older and moved out of the house now but they all seem real excited about getting something of their grandpas that they remember him by. Post away, some may get offended but who really cares at least you have one Bachmann loco. The rest is lagniappe. I'm sure you will find most are helpful here. So I just counted and there are 9 controllers. Why would anyone need 9 of them. I see that it takes one to run the track right? so what are the others for? Block control ( you can read about that in my other links), and accessories. Your father must of had a decent size layout or went through a lot of power packs. I tested the power packs and they all work. 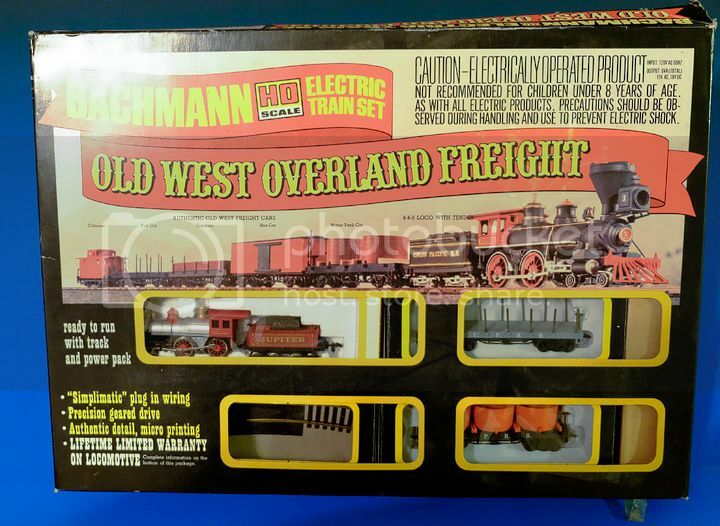 I just found two complete sets, new in box Bachman train sets. They look like them may be an inexpensive sets but that is cool. They come with everything you need, track, power, engine and cars. Kinda cool looking. I will upload photos when I can. Probably not till Tuesday. I really appreciate all the help you guys are giving to me. I think this may become addicting that is if I can get them up and running. So here are some of the things that I have. Let me know anything about them that you know. It would be good to know if they are good things or trash. First of all: Nothing you have shown us is "garbage" or "trash." In fact, you have shown several common, but very usable items, especially the locomotives and power supplies. There is an old saying: "One person's trash is another person's treasure." Do Not under any circumstance throw any of what you have in the trash! I don't know where you live, but I would suggest you get in contact with the local branch (probably a division) of the NMRA (National Model Railroad Association). Many of the folks there are H0 scale modelers and can help you evaluate your father's collection. They can also help you get some of it running for you and your family members to enjoy, and advise you as to what to do with whatever does not interest you or your family. You do not have to be a member to follow the chain from the national organization down to regional, division and local resources. Just spend a little time exploring and I will bet you find a local club with members who will gladly work with you to understand what you have and how best to preserve the memories. And yes, Model Railroading IS Addicting! most of this stuff appears to be from the late 1970s .early 1980s. the mrc power packs are good, far better than anything you'd get in a train set even to-day. in particular, that tech 2 was state of the art for that era. 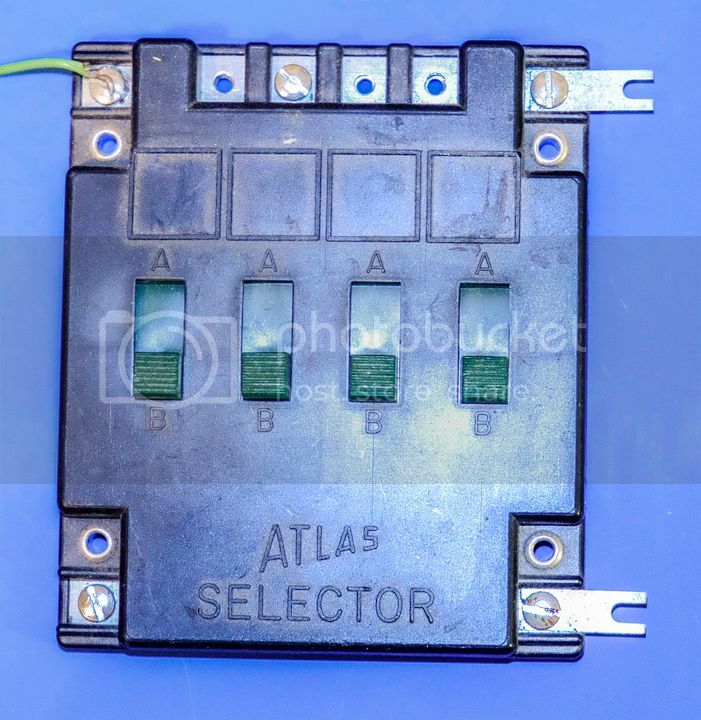 the atlas selector is a set of block control switches. they are used to control sections of track from either of two power packs. 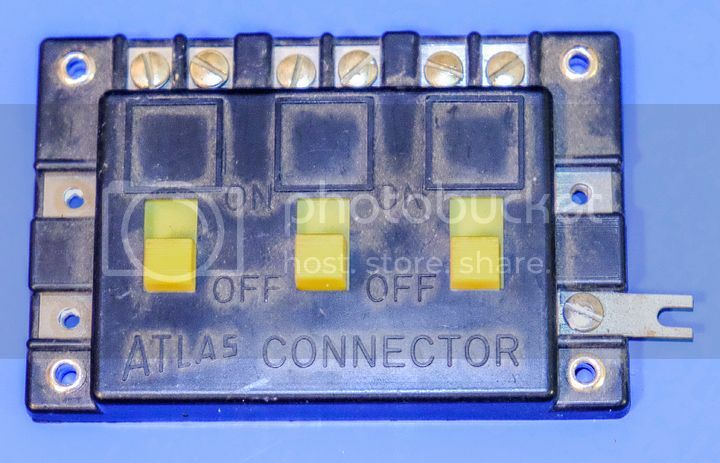 the atlas connector does a similar job, but with only one power supply. in both cases, you can completely turn off a section of track if you want to park a locomotive there. the atlas components are still made. the tyco item is a switch controller which allows you to throw track switches by remote control. 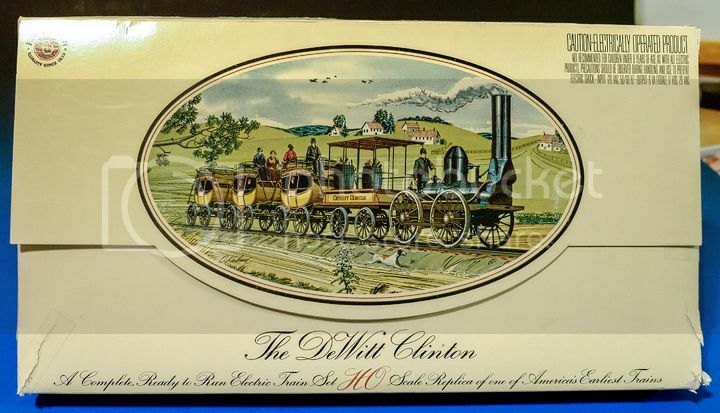 now for the trains: the dewitt clinton set is a fragile piece not known for running well. they make a nice display model though. the Burlington northern is an athearn sw7. athearns were among the best locomotives of their day. they are a simple, robust design which is easy to work on. parts may still be available but you probably won't need to replace anything. clean the wheels and motor and it will run, I'm sure of it. the Chattanooga is a tyco gp20. the santa fe appears to be a tyco "f9" both of which were marginal performers. they only pick up power from 4 wheels, usually brass which is hard to keep clean. they also only have 4 wheel drive which means they won't pull much on an upgrade. if they don't run, you can remove the drive gear and use them as dummy locomotives. the old west train is also probably marginal. due to its small size and light weight it won't pull much. of all the locomotives you've shown so far, the Burlington northern is the best of the bunch, definitely a keeper. Thanks guys. Funny you should say that about the Burlington Northorn. It is the only engine that I have been able to make run good. I live in the middle of nowhere and the closest town to me would be about 4 hours. I will look up that club info though and see what I can learn. Jward - I'll have to disagree with your assumption that the Old West loco won't pull much. This is my Old Time 4-4-0 pulling 28 or 34 (I can't remember which) Old Time Cars. Half of it is up a 2% grade. It all depends on if the loco has traction tires. Your father used DC block control. I had written a long explanation just before my computer crashed! To get right to the point, that black and green thing is an Atlas Selector. If that is the only one he had, your father had his railroad divided into four blocks: segments of track that could be controlled independently from either power pack. If he had more than one Selector, they can be ganged together by attaching the screws on the left side to the forked terminals on the right side of the next one. Call one of your power packs (and they are a very good brand) Pack A and the other Pack B. Run the green wire from the upper left of the Selector to one of the controlled DC power terminals on Pack A. Run another wire from the lower left screw on the Selector to the screw in the same position on Pack B. The four green switches have a center off position, although you probably won't be able to feel it. There are four screw terminals along the top of your Selector (you are missing three screws). Each terminal is fed by the green switch below it. Push the switch up, Pack A feeds it. Down and Pack B feeds it. Center is off. Power is fed to the track from those four terminals. Divide your track layout into sections based on the number of Selector terminals you have. Use insulated rail joiners to divide one rail (either the outside or inside one) into insulated sections, and wire each section to its own terminal on the Selector. Note that although you have two power packs, you only need one wire from each Selector terminal. What about the other side of the circuit? 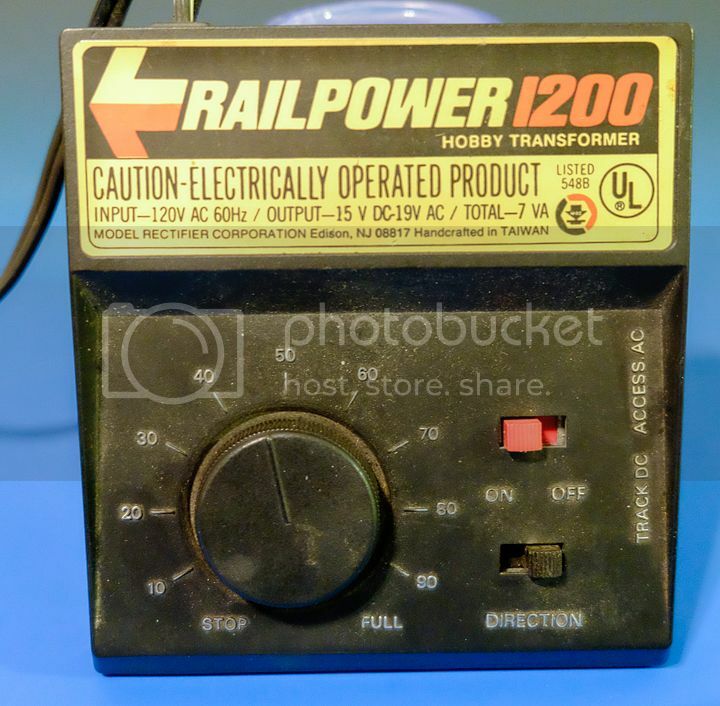 Take the other rail (the one not divided) and run a wire from that rail to the other controlled DC terminal screw on one of your power packs. Then run a second wire from that same terminal to the other controlled DC terminal on your other power pack. That is all there is to it! No DCC, no decoders, no programming. This is the same system your father was using. What about the other stuff? The Atlas Controller is like half of a Selector. It only controls power from one source to three track blocks. You would use it, for example, powering engine parking spaces that would be powered from only one power pack, or to jump power from an already powered track to make killable sections. 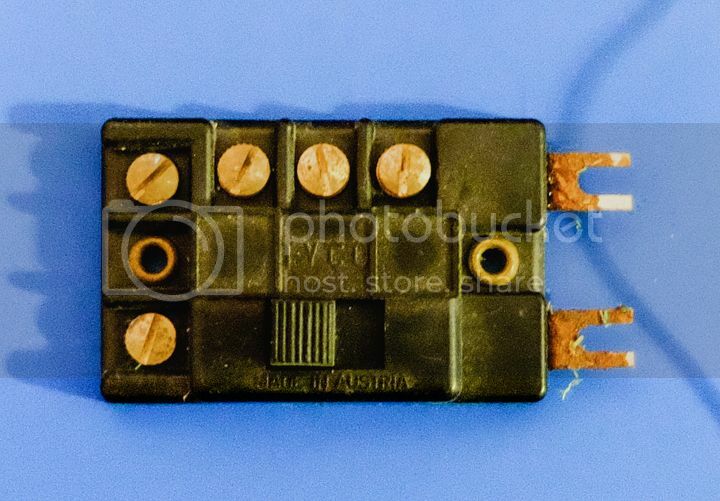 What is the Tyco component with the rusty terminals? I don't know. My guess is either a single-switch version of an Atlas Controller, or maybe something to feed power to a DC-powered accessory (AC-powered accessories usually use three terminals). If your engines ran OK when last used, they probably will again after being cleaned and oiled. You will probably want to replace your horn-hook couplers with modern knuckle couplers, sine they work a lot better and you are missing some now. I hope this helps, and takes some of the mystery out of DC wiring. The Tyco electrical item is a remote switch controller. Power comes in from the left and the thee terminals on the top connect to the switch machine. Slide the button to one side or the other and give it a brief push to throw the switch. 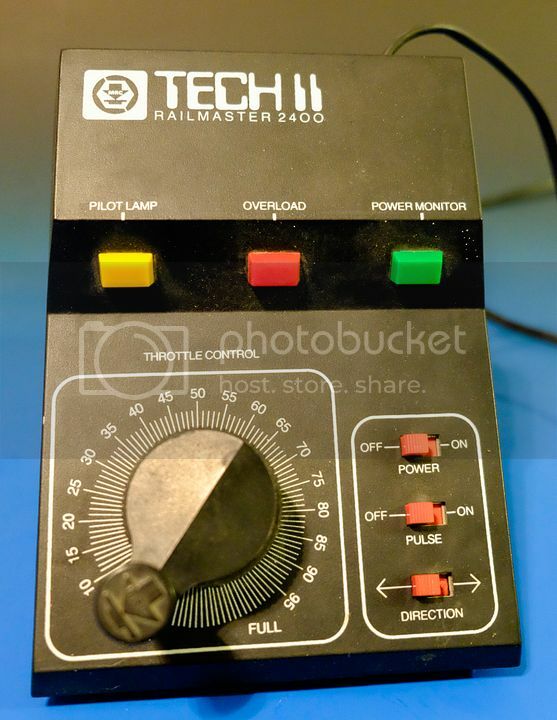 Controllers like this have been around forever (at least 50 years), and any book on basic wiring will have instructions on how to hook 'em up, including how to daisy chain them to save wire. The current Atlas controller is almost identical except for color. Hope this helps.